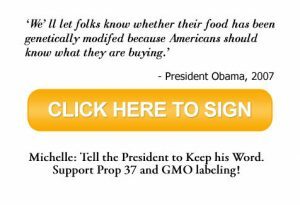 If you think you should have the same right to know what’s in your food as consumers in nearly 50 other countries, please help us pass this country’s first GMO labeling law – Proposition 37, the California Right to Know Genetically Engineered Food Act – by signing this petition today. You might think, what’s the point of signing another petition when Monsanto employees are in bed with the federal government? When politicians repeatedly reject the pleas of the 90% of consumers who demand GMO labeling? When Monsanto and Dow and DuPont and major food processors like Pepsi and CocaCola have already put up $25 million to defeat GMO labeling in California? The point is this: Every news story we create that draws attention to this David vs. Goliath fight helps fire up California voters by showing them that every sane, health-minded consumer in the country stands in solidarity with them on this issue. And fired-up voters are more likely to get out and vote. Please sign this petition today. When we reach our goal of 200,000 signatures, we will hand deliver this petition to the White House, and make sure we have national media on hand to tell our story. On the campaign trail in 2007, candidate Obama promised to support the right to know what’s in our food. 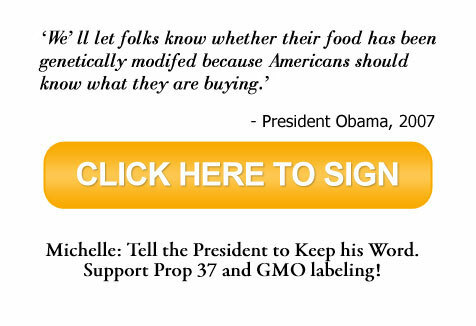 President Obama, however, has since sided with Monsanto – not the voters who elected him, not the 90% of people in this country who want GMOs labeled. Mrs. Obama is famous for the White House organic garden, for speaking out against childhood obesity and for better nutrition in school lunches. She’s the President’s closest confidante. So we’re calling on her to tell President Obama: Keep your word. Listen to the people, not the corporations. Do the right thing. We may not be able to change the President’s mind with this petition. But we promise we’ll get his attention and hold him accountable – in an election year – for what he promised us four years ago. Prop 37 is the best chance we have of defeating the corporate agri-giants and of forcing food manufacturers to stop hiding potentially dangerous ingredients in our food, without our knowledge. Please sign today. And then forward this to everyone you know, and ask them to sign, too. Every action counts. Thank you!